Saint Joseph's Catholic Academy's Kolby Franklin wrestles Southern Columbia's Gaige Garcia in the 195-pound title match at the 2019 PIAA Championships. Photo by Emily Rose. 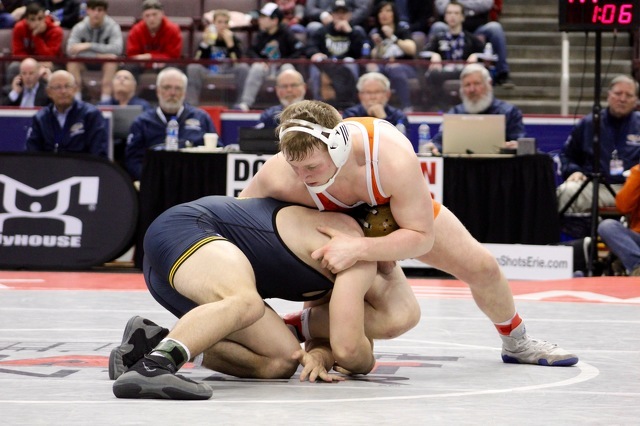 Saint Joseph's Catholic Academy claimed second place in Class 2A and Wolves freshman Kolby Franklin earned a silver medal at 195 pounds to lead the way among Centre County teams at the PIAA Wrestling Championships this weekend in Hershey. Nine county wrestlers brought home medals, with five of them belonging to Saint Joe's. Caleb Dowling took third at 145 and Keegan Rothrock took the bronze at 152. Zack Witmer and Tyler Stoltzfus both claimed fourth at 132 and 160, respectively. Penns Valley's Baylor Shunk and Malachi Duvall also earned Class 2A medals, with Shunk taking seventh at 120 and Duvall seventh at 138. 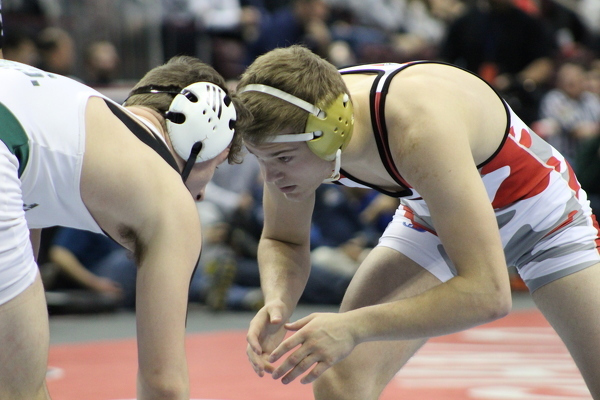 In Class 3A, State College's Cole Urbas finished fourth at 195 and Bellefonte's Ethan Richner was sixth at 152. For Saint Joe's, freshman Franklin turned plenty of heads with his run to second place in a weight that's not typically friendly to underclassmen. Franklin went into the third period of the title bout tied with Southern Columbia's Gaige Garcia, 1-1, but late in the period Garcia got a takedown and near-fall points to come away with a 5-2 victory. “That’s the state tournament, you get wins and losses by a hair sometimes," Saint Joe's Coach Pat Flynn said. "These kids’ dreams are crushed sometimes, and he’s already doing pushups for next year. Dowling, meanwhile, defeated Southern Columbia's Gavin Garcia, 3-0, in the 145 third-place bout to give the Wolves junior his third state medal. Rothrock earned third place at his first PIAA Championships with a 3-2 win over Greenville's Mason Karpinski. Witmer and Stoltzfus both dropped close third place bouts. Witmer lost in a 6-5 decision to Bedford's Kaden Cassidy at 132 and Stoltzfus fell 2-1 to Saucon Valley's Matthew Arciuolio at 160. Saint Joe's finished the championships with 95.5 team points, behind only Southern Columbia's 121. With each of his team's medalists set to return next year, Flynn is optimistic about the future. "Very nice, the future’s bright," Flynn said. 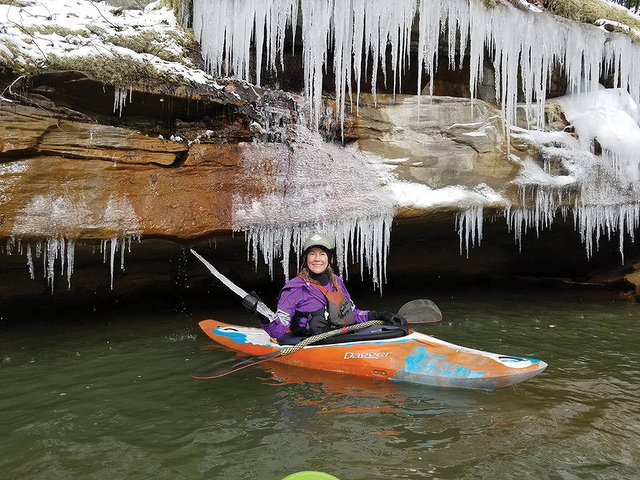 "These kids have high goals and they’re going to be training to reach those goals. All of them have to just keep improving a little bit here and a little bit there." Things did not go as expected for State College's Urbas. The Little Lion senior was the runner-up at 195 last year and came into this year's tournament undefeated with a No. 1 ranking. But in Friday night's quarterfinals, Northeast High School's Jameel Coles pulled off a huge upset, defeating Urbas 8-7. Urbas battled his way back in the consolation bracket before dropping a 5-1 decision to Thomas Jefferson's Max Shaw in the third-place bout. "He’s a mentally tough kid, he bounces back. He’s resilient," State College Coach Ryan Cummins said. "Your mind is thinking ‘gold’ the whole time and then when things shift, it’s difficult. But he took it very well; better than many I’ve seen in that situation." Penns Valley's Shunk capped off his senior season with his second state medal and tied Curt Decker for the school record in career victories with 132. Shunk defeated Biglerville's Blake Showers, 10-5, in the 120-pound seventh place match. His teammate, Rams sophomore Duvall, won a close battle against Saucon Valley’s Thomas Spirk in the 138-pound seventh place bout, getting a third-period escape for a 9-8 win. "He wrestles really well when he’s behind. 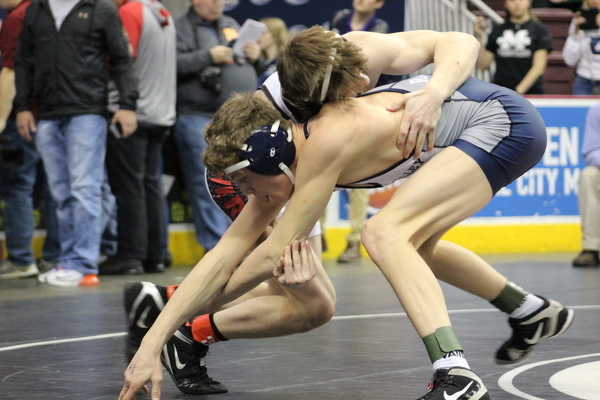 He wrestles with urgency," said Penns Valley Coach Joel Brinker. "But when gets the lead he shuts it down. So we’ve got to figure it out for him to keep that same intensity when he’s got the lead. He lets guys back in the match. He did what he had to do in the last 15 seconds to get that escape. But he’s good on the mat. So he knows where he needs to work and where his weaknesses are but he’s only a sophomore and he’s got two more years. "This tournament is crazy. A lot of upsets happen; a lot of top guys go down. So they’re in great company by placing in this tournament." Bellefonte's Richner, a sophomore, sailed into the 152 pound semifinals, where he was stymied by Kiski's Cam Connor, the eventual second-place finisher. 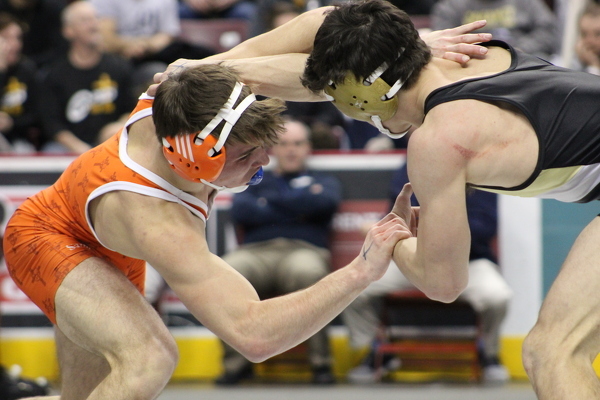 Richner dropped a 9-3 decision to Connor, then lost his first consolation match, 6-1 to Hershey's Tanner Updegraff. "He’s a sophomore, you know, and they come here for their first state tournament and you don’t know quite what to expect," Bellefonte Coach Mike Maney said. "Will they get caught up in all of that? For the first two matches he really didn’t. But then he ran into a really good guy in the semis. And you know sometimes you get that close to your goal — state championship, state finals — and then when you lose, you’ve got to refocus yourself in about 45 minutes and get your mind right. He gave up a couple takedowns there that maybe he wouldn’t (in the consolation loss to Updegraff). If nothing else, it’s a learning experience and he sees some things he needs to work on for next year. "These are obviously really, really good guys (at the state tournament) so when you have a weakness you can take a lesson from it. We’ll go back to the drawing board for next year." Richner went on to lose 11-9 in sudden victory to Carlisle's Colton Zimmerman in the fifth-place bout. "It’s a credit to him coming down here really focused," Maney said of Richner's overall success. "He certainly worked hard and put in the time. He’s been pretty consistent for us and placed in some big tournaments, so he’s certainly capable of it." Saint Joe's Tyler Stoltzfus (160) earned fourth place at the 2019 PIAA Wrestling Championships. Photo by Emily Rose. 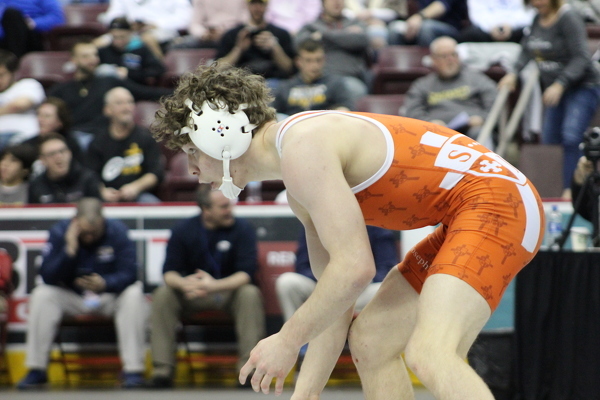 Saint Joe's Caleb Dowling (145) took third place at the 2019 PIAA Wrestling Championships. Photo by Emily Rose. 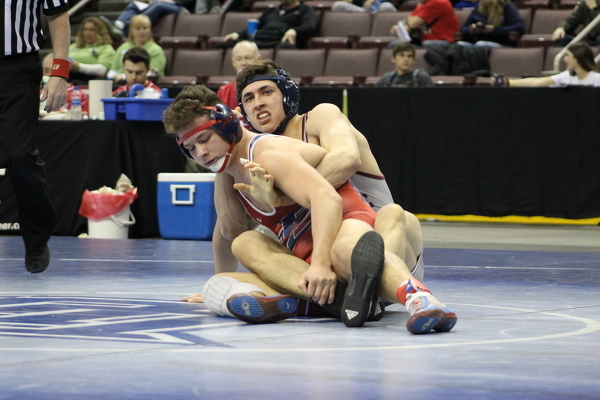 State College's Cole Urbas (195) placed fourth at the 2019 PIAA Wrestling Championships. Photo by Emily Rose. Penns Valley's Malachi Duvall (138) finished seventh at the 2019 PIAA Wrestling Championships. Photo by Emily Rose. Bellefonte's Ethan Richner (152) places sixth t the 2019 PIAA Wrestling Championships. Photo by Emily Rose. 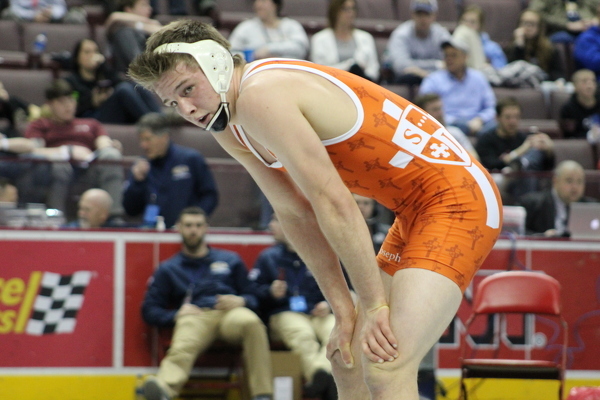 Saint Joe's Keegan Rothrock (152) took third place at the 2019 PIAA Wrestling Championships. Photo by Emily Rose. Saint Joe's Zack Witmer (132) took fourth at the 2019 PIAA Wrestling Championships. Photo by Emily Rose.